Friends of Field is a group of neighbors who have organized for the betterment of Field Elementary School. The group is currently undertaking an initiative to implement a "College-Bound Culture" at this school. Early college awareness helps young students see possibilities in their future and understand how to access those opportunities. This fall they would like to decorate the cafeteria with as many university pennants as possible, and we hope to display the pennant of each teacher's alma mater on his classroom door. They would also like to use college stickers, t-shirts, and trinkets as incentive rewards for the school's reading programs. The group would love to give neighborhood residents the opportunity to see their Alma Mater represented at Field! Perhaps you'd like to donate a pennant or stickers from your school? They would love to be able to teach the kids about all kinds of schools from all over the country! You may contact Lindsay Hunniford with any questions. She is the group contact and will be collecting items over the summer to have them ready for the the start of school in August. Thanks! -Anything else "collegiate" you can think of [that is elementary age appropriate, obviously]! This is a great idea from a great group making a difference for Heights kids! Also on-going: Heights resident, artist and junk shop purveyor Bill Davenport is currently working on creating Houston's "Giantest" ball of yarn. As of the last update his yarn ball was 67" circumference and 40 lbs. To help complete his project, Bill wants your old yarn. He says he's not picky: "any color, style, age or quantity. It all goes in, and never comes out again, like a yarn black hole!" I'm kind of a bad 'client' to some businesses because my love of trying new things often trumps my support of service providers. One exception is my hair stylist. I have been going to her since I pretty much moved to Houston; since the very 1st time she cut my hair when the guy who was recommended to me didn't have an appointment available. I don't see her as often as I should but luckily I have pretty low maintenance hair... But, when I need a cut it's usually gotten to the point where I really need it. I had an appointment for June 16 at 10 AM with my stylist. I needed it. I had 2 big things that week and Wed was the only day I had a sitter for Wee One. You can imagine how my heart sunk when I picked up my cell phone Wed morning to see a message from the salon that my stylist wasn't going to be able to make it in to work due to a family emergency. She is a mom and I am a mom and of course I understood, but I still needed a haircut. I quickly started running down a mental list of all the places I knew of close to home. It had to be that morning and I had a lunch date so it had to be before or after lunch but I would have to be home by 3 to relieve my sitter. Pretty small window. I searched the archives of the Heights Kids' Group forum to see who had been recommended. A friend had posted a rec for Maryanne at Shine in the Heights and her comments had been echoed by a couple other moms. I called. Voicemail. It was not quite 9 am. I got worried. In the reviews section of the mommy mafia forum there were 2 glowing recommendations for La Paz Day Spa. I've been to La Paz for waxing before and always had a great experience. I called. Someone answered! They were booked. They offered to put me on a waiting list. Sigh. I remembered there is a little spa on 19th called Heights Spa. I googled them and pulled up the site. They don't do hair. I went back to the Heights Kids forum. The 3rd recommendation I saw was for David, Etc. I knew the salon well even though I had never been inside. It shares a building with Berryhill and, yes, my family is one of those where the parents drink margaritas on the patio while our kids go feral. We go quite often, always walking by the doors for David, Etc. The praises on the forum were for Wendy, but I wasn't even going to try to get a specific stylist. I needed my bangs out of my eyes and a trim along the bottom and I needed it now. I couldn't find hours of operation on the site but I called and someone answered. I started talking and the voice on the other end stumbled, something about they weren't open yet but never really completed that thought and instead asked how he could help me. I explained the situation and he said he would check the schedule. I was in luck! He had a stylist with a 10 am slot open. It really couldn't have been more perfect since I was having lunch right across the street at Zelko Bistro. I wouldn't even need to move my car. When I got to the salon it was just opening and was still on the quiet side. Music was playing but chatter was absent until I was introduced to Ludmila, who would be cutting my hair. We started talking about my hair, how Amelia usually cuts it, what I wanted today. I tried to use professional terminology that I hear Amelia say, "point cut" and "tapered" and "asymetrical." It's hard communicating another stylist's vision and technique. I figured at the worst, it's just hair, it will grow back out. Typical shampoo, good smelling conditioner. Comb and cut. It was pretty much what I expected and looked great. Blow dry, shine spray. I loved it. Was it exactly the same as what I get from my regular stylist? No, but that is what makes me enjoy cheating on my other service providers from time to time- just seeing what else is out there. Of course, my loyalty to Amelia is unflagging in the end and my next cut will be by her, but it was nice to try somewhere so close to home. If you're looking for a new stylist, you have lots of options in the Heights! David of David, Etc, and Ludmila, who sure came through for me in a pinch. FYI- David has been operating in the Heights for 10 years, six in his current location but some of you may remember he was the last long-term business to occupy the little green gas station across the street. Friday, June 25, 7PM: Idgy Vaughn at Heights Live! "Trouble is headed to Heights Live Idgy is trouble in the sense that she excels at throwing people off their guard, and then knocking them flat. Misjudge her by the way she might traipse onto a stage in a sun dress andcowboy boots, all playful red curls, big green eyes and bigger smile, and she’ll blindside you with a song she wrote about raising her daughter as a single mother in the projects, or an equally devastating character study of a co-worker she knew during her “Truck stop Waitress” days. If you’re having fun just reading this clip – imagine what a great show this is going to be!" This is a family-friendly music series, or if your child is too young to enjoy the show event child care is available for $10 per child. Please contact www.heightspres.org for more info or to reserve child-care. 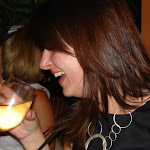 If you're looking for the Etsy birthday recap, you can see the pics in a Facebook Album until I get the actual post up. As you already know, I was fortunate enough to be on the planning side of a great little event that happened last Thursday, June 17. Houston author Katherine Center came back to the Heights, the setting of her first novel, to mingle and tell us a bit about the journey from being a 6th grader writing novels about Duran Duran to being a published author with a movie optioned. When Katherine and I 1st started talking about her coming to the neighborhood for some kind of event, we discussed maybe getting a room at the Heights Library. There was one little problem with that: I wanted wine. It didn't take much more brainstorming for Margarete and The Artful Corner to come to mind. When I spoke with her a couple months ago, Margarete mentioned past events at the gallery and I thought it would really be the perfect venue for this event- bright, fun, intimate and there could definitely be wine. I also hoped to bring some more people in to The Artful Corner, benefitting one of my favorite local businesses as well. While I like to use Heights based vendors, I went for simplicity by ordering a cheese platter and dessert platter from Whole Foods. Margarete was happy to host and we set about planning. It wasn't hard- picked a date, talked about what would be served and I reached out via this blog and Heights Kids Group to see who wanted to attend. And then it happened. It was an awesome night and the crowd was perfect. There were several cancellations at the last minute. We understand. That's what happens when husbands have to work late and kids get sick and life happens. Oh, and then there was my good friend who has major pregnancy brain and forgot all about it until she was in her PJs and happened to see my Facebook status... But despite the cancellations, the crowd was a great size. Everyone had plenty to eat and drink and it was all front row seating for Katherine's talk. Baby Ruby seemed to really enjoy her 1st "meet the author" event. She was quiet as a mouse and cute as button the whole night. Katherine talks like she writes. If you've ever read her books you can easily imagine the delightful time we had listening to her tell her story. I won't tell any more than what I already have (Yes, it really started with Duran Duran) because you should see her in person some other time and hear it yourself. She is truly entertaining. Witty, funny. Animated. Katherine is one of the few people I've seen in my life who uses her hands to talk more than I do! After telling us about parties in New York, readings in LA and other things that made me want to be a published writer, Katherine entertained our questions and comments. Then it was almost 9 o'clock and time to head out. We bought books and had them signed, got our pictures taken and said good night. It was like leaving a good friend's house from a dinner party. I couldn't have asked for more than that. For Katherine, she sold all her books. For Margarete, 15 new customers were brought in since only one person who attended had ever been in the store before. I hope they count the night as a success as well! But today is not that day and Mairi and Paul are not those people. No one who deals with musicians on a regular basis has an average or mundane life. And dealing with musicians is just what this Houston-bred couple does from their metal building on 19th Street. Nestled between the crazy fire salvage warehouse and Gen's Antiques, the funky metal building that houses 226 Recordings is a cozy and welcoming space for musicians to record. The front of the building houses a recording studio. The back of the building houses a family. Once you're buzzed in through the gate, you enter through a small reception area. A computer is set up for entertainment while you wait. Another door will take you to the "live room" which can accommodate an average sized band. Knowing nothing about the ins and outs of a recording studio, I was so impressed at all the thought that goes in to each space. The live room has all kinds of stuff to prevent echos and "keep pure sound." From ceiling diffusers to bass traps to an absence of right angles, everything is set up to prevent bounce backs and help the band get only the sounds they produce. Singers may want to stay with the band, but if they want a separate space there is a standard vocal booth or 2nd isolation room for a single person. 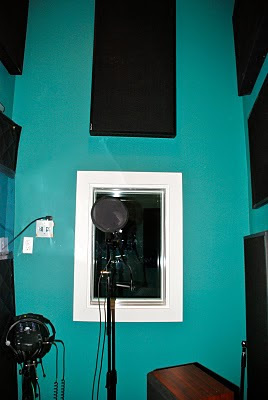 These rooms have similar features to the live room but also creates a slightly different sounds, giving vocalists options. I know less than nothing about the recording process so my tour with Mairi was a real learning experience. I learned a lot of jargon and technical terms- things I wrote down in my notebook that I can't make sense of now. I couldn't help but scribble everything down. She was so enthusiastic about it! 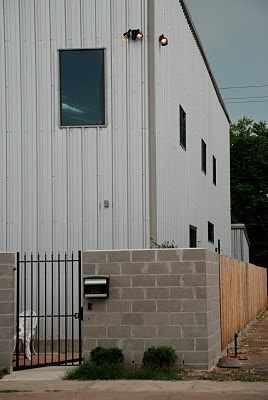 I enjoyed learning more about the process, but in the end what I really wanted to learn was how does a young family end up building a recording studio in a metal building in the Heights? Paul and Mairi both grew up in Houston. They were friends in high school and were friends when they parted ways for college. Mairi went to UT, and Paul headed to the West Coast to attend Pepperdine. After college, she came back to H-town and Paul went to LA. He ended up working at the famed Cherokee Studios where he was able to work in the heart of the classic rock establishment. Like happens to many, though, Paul tired of the pace of LA and decided to come back home. He and Mairi had remained close throughout and when he returned to Houston, their relationship progressed. To get back to Houston, Paul had taken a job doing real estate development but when you have the kind of background he did, you can't just walk away from music. Working full time at real estate, Paul operated a small recording studio out of his apartment. He also worked for Fellowship of the Woodlands, a local mega-church, doing live sound mixing and editing for their tv broadcasts. Eventually having his own studio was always in the plans. Next thing you know, economic downturn and real estate slump. Paul and Mairi saw this as the perfect time for Paul to jump ship and return to his passion and talent. He was able to get a decent job working for a local studio that also teaches audio engineering. In fact, even after opening 226 Recordings, Paul has remained at that studio teaching. As career paths changed and a family started, Paul and Mairi searched for a place to settle in. They started out looking for a house with a decent garage. They really wanted work and home to be on the same property. Being natives, they know Houston well and really were set on the Heights. Yes, they love the "feel" of the neighborhood like the rest of us, but for business purposes it's also convenient and central for clients from all over greater Houston. Often people who grew up in Houston have mixed feelings about the Heights. I regularly run across people who still envision the Heights of 20 years ago. Mairi knew better, though. Growing up, her mother's best friend lived in Garden Oaks, and she has friends who settled here over the years. So, they looked and looked for that house that could accommodate their needs. And they couldn't find it. During the time they were searching for a home Mairi was working in commercial real estate. She came across a lot, a parking lot to the rest of us, for sale on 19th Street and that was it. They decided to start from scratch. It took about 9 months to get all the permits in order and 7 months to build the space. They hired a studio designer to create the recording space and took what was left on the back and created a home for them and their infant daughter Clara. When the house was complete, Mairi left real estate to manage the studio business and care for Clara. It was ideal to have the work and living spaces together. I asked Mairi what it was like living on 19th Street in the middle of a commercial district. I kind of expected an "it is what it is" answer, but that is not what I got. She referred to the store owners as her "neighbors" and said they all drown Clara with attention. She said "When you live in a [residential area], you can't just walk outside and in to your neighbors house" but she can. The merchants on her block were totally supportive, even when construction of the building took up Gen's parking lot. She likes the fact that it's kind of the "opposite of a neighborhood" by being full of activity during the day and then totally quiet at night. Of course, it suits the work they do as well. "Bands can hang out in the [front courtyard] and not disturb anyone." She also loves how she can walk so many places. That, she says, is a "Heights thing." Sarah says "to RSVP Visit the Meetup site and click “I’m Interested!” so that Houston can stay in the Top 50 cities! Even if you’re not sure right now that you can go, but you’re still interested in attending, you can help Houston stay on top by clicking - if we’re a top 50 city Etsy will send us all kinds of goodies to give to attendees!" Stores along our little main street, 19th, will be open late offering treats and sale specials. RSVPs with payment are required due to limited seating and will be on a "first come/first served" basis. A Peaceful Pet is excited to present their summer charity fundraiser for Friends for Life, the fastest growing No Kill animal adoption and rescue organization in Houston. Sandy will be introducing a new artist into the salon. Jill Stacy, a charcoal and pencil artist, will be on hand at the event to discuss her drawings. Her pet portraits are both captivating and moving. A portion from all of sales of Jill's work will be donated to Friends for Life. A Peaceful Pet believes in supporting local rescue groups. Please help them support “re-cycled” pets in need. Families and pets welcome. Take home some freeSolid Gold and Stella and Chewy's pet food and treat samples. They'll be running specials on pet supplies and a portion of those sales will also be donated to Friends for Life. Refreshments will be served. ALL Whole Foods Market Houston stores are participating! Bring Rover over for a good, old fashioned wash and support this great organization!!! Dog washes will be given by volunteers with hypoallergenic all-natural shampoo in exchange for a monetary donation. Pet Paradise will be onsite providing FREE giveaways for guests that donate either pet supplies or monetary support. I was taking 10th from Shepherd to get to the Blvd. There was a car and truck stopped on 10th and I cut south rather than wait. Correction: This was before I turned and is at the intersection listed above. Anyway, I was blown away. 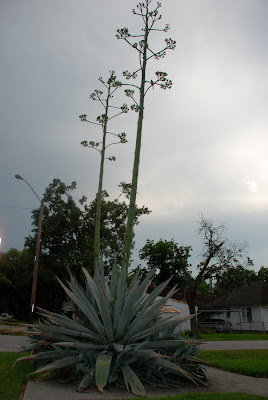 I have never seen a Century plant this big. It reminded me right away, like most oversized plants do, of Little Shop of Horrors. It's 2 stories tall ! I don't know a lot about plants so I googled it, thinking the sheer size might mean it's very old. I was dismayed to find that the plant is probably on it's way out. According to one site "Century Plants bloom only once in their life, the blooming spike is so large and grows so fast that it saps all the resources of the plant, which then dies, leaving a tall wooden seed stalk. The plant is called the "century plant" because of this "once a century" bloom (actually the plant lives an average of 25 years). It was also an important plant to indigenous people, being used for medicines, fiber, needles, and food. " I took this picture over 2 weeks ago. I wonder if this big guy has been sapped out yet? Early last month, I shared the deeply personal experience of my trip to The Wax Spot on 12th. I mentioned their lease was up and that Angelica and Christie wanted to stay in the Heights and were looking for a new place with a similar feel. I am happy to report they have found it! Walking down Heights Boulevard with the family, I spotted their banner hanging off a little house just next door to Donovan Park. This weekend I popped in for a visit. The space is similar to the old location in that it's a bungalow. This new house is more... intimate inside. Where the last one was a more open floor plan, this one has smaller rooms with a long hall. Maybe it's just my personal experience, but I actually liked that better. Most spas I have been to have been just that- long halls with treatment rooms off to the sides. I think it offers more privacy. The room set up is the same as the old location but, again, the space is smaller. And, again, I think for the purposes of this business smaller = better. One thing that has grown in the new location is the staff. Angelica has hired an esthatician, Stacy. Stacy is going to be doing facials, including microderm abrasion and acid peels. She is running a special right now, too: microderm facials for $100. If you've ever had this treatment, you know what a good deal this is. Normally it ranges from $130 to $180, depending on the spa! For $25, you can add a peel. Long time front man for Houston's Romeo Dogs, Mitch Jacobs is known for his rapport with the audience and for playing solid, soulful Texas music. Freddie Steady Krc is a Texas Music Hall of Famer with ties to other Texas legends like Roky Erickson and Jerry Jeff Walker. Heights Presbyterian also offers child care! Contact them via the Heights Live link above. BYOB permitted. Refreshments and set ups available at the venue. Music and lyrics by Broadway composer Mark Hollmann transports us back to ancient Greece. A girl has fallen in love. The grouch is her father, who finds out his daughter is in love with the son of his sworn enemy and locks her up. The goat is what the town will sacrifice to get rain to end the draught and , therefore, the gauging of the Grouch who owns the only well in town. Lots of folks end up at the bottom of the well but happiness overcomes. 8 p.m. Fridays and Saturdays, and 2 p.m. Sunday, June 13. For information, call 713-838-7191 or visit www.upstagetheatre.org. From The Houston Press: There are comedies, dramas, mockumentaries, romance and science fiction. One of the more challenging genre selections, according to Houston producer Laura Schlecht, is musical or western. "Some people make a musical, some make a western, but every once in a while we get somebody who makes a musical western. That's always fun," she says. Each entry will be screened twice during five separate screening blocks so viewers will have multiple opportunities to see the offerings. 5:30 and 8:30 p.m. Tuesday, 5:30, 6, 8:30 and 9 p.m. Wednesday and Thursday. For information, visit www.48hourfilm.com. $10. Need something to occupy your little ones this summer? Young at Art is having summer camps on 19th Street! Please join Houston author Katherine Center for readings from her latest book, Get Lucky. The evening with Katherine will be an intimate and FREE event with book signing, witty conversation and light refreshments. The Artful Corner will also be offering a 15% discount on select merchandise for the event. This is a great opportunity to support a local writer and other local artists! Copies of Get Lucky will also be available for sale. WARNING: I may hereby be exposing myself as a huge dork. I was walking with my kids, actually taking the Big Boy to school, one morning bobbing and weaving through Woodland Heights. All of the sudden, Big Boy says "What's that, Mommy?" 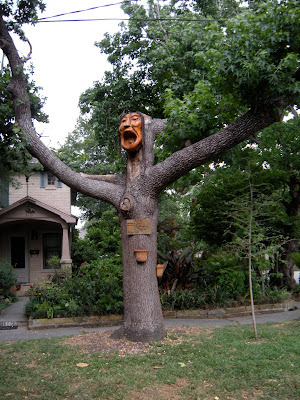 And when I looked up and saw the large tree with a carved face and hair made of chains, I naturally said "It's an Ent." Being 3, he had no idea what I was talking about and when I tried to explain what an Ent was rather than what the tree on the corner was, he corrected me. "Trees don't walk or talk, Mommy. That's silly. What is that on the tree?" I gave in and told him "Someone carved a face out of wood and put it on the tree to make it art." He accepted that explanation and I could only think "So much for the great imagination of children..."
It's not too late to join the fun! Registration available the day of the race! Start time for runners participating in the sanctioned race will begin at 7:30 a.m. Walkers will start at 7:35 a.m. and the Kids 1K follows at 8:30 a.m.. The course starts at Heights Blvd. @ 18th Street heading South, turning around at 5th Street and heading north on Heights Blvd. Stopping point for all participants is Marmion Park where the post race party will begin. Plan to celebrate with food, juice and music while awards are announced and door prizes are given! Price - Race Day: Adult $30. Kids $20. June brings the heat and the Market's summer hours. With lots of art, people watching, live music and food, it's a great reason to head up to 19th Street on Saturday afternoon. Saturday, June 5, 6-9 PM: Obsidian Art Space is pleased to present Marie Valdez : The Duplicity of Space together with Amy Taylor : Lost. Obsidian Art Space is excited to present the work of two local artists who use local architecture as their subject matter. Marie Valdez creates paintings which explore how Houston's architectural structures relate to our everyday environment. Photographer Amy Taylor captures Houston's quickly disappearing architectural history. TCPA's Heights office is offering 2 presentations for new parents. Programs are free and refreshments will be served. 1919 North Loop West, Suite 140. Register today by calling Tonya Wiltz at (713) 869-1692. Saturday, June 26, 10-11 AM: “Healthy Sleep Habits for Children” with Niccole Greeley, M.D. Visitors are encouraged to explore the newly remodeled store with their families, experience a taste of Scandinavian cooking June 9 through 14 for a $1, which includes Swedish meatballs with potatoes, cream sauce and lingonberry jam, in the 350-seat restaurant or have their children enjoy time playing in the supervised children’s play area, Småland. Are you sensing a pattern here? This is the 2nd time a 3 day weekend has thrown me off and I didn't realize until this morning that it was Wednesday and I should have posted this week's happenings. I only have a couple things (like the Heights Fun Run and 1st Saturday Arts Market) so I should be able to get it done today at some point. Don't forget- if you have any events you want or think should be published here, you can always email me at theheightslifehouston@gmail.com . I don't always get to everything but I try my best!